This foyer for the Royal Institute of Engineers in The Hague by Dutch practice AAArchitects has a large door which folds up from the glass facade to create a porch. 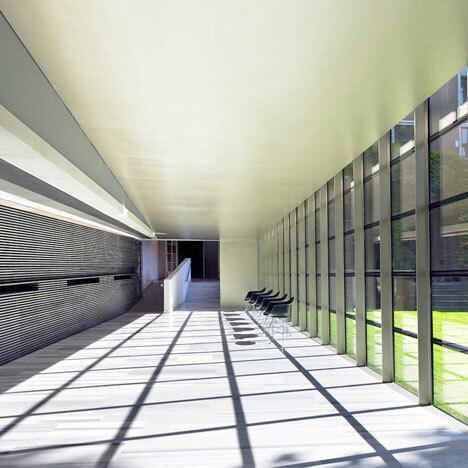 Constructed from a gridded steel frame and clad in silicone-seamed glass panels, the KIVI NIRIA foyer increases in height and width from one side to another, linking together the previously completed auditorium and another adjacent building. Internallly, a long linear bar with a wooden top provides a surface and storage space. Supplementary to the design of the adjacent auditorium for the Royal Institute of Engineers in The Hague, AAArchitects has been asked to add a foyer to the existing passageway. Because of this double role in function as a passageway and a foyer, we have chosen to limit the physical separation to a minimum and subtly indicate it with a jump between the roof and ceiling levels. The passageway runs from the beginning to the end straight and preserves its width, whereas the foyer part broadens towards the auditorium where the busiest junction will be. By choosing not to separate the space and avoid any columns between the two spaces, both parts together can be used as one space for the biggest crowds. The grid of the existing historical pawn has been persevered in the new facade and fans to the other building. The complete new facade exists on the outside only of glass and silicone seams, which are supported on the inside by a steel frame of T-profiles. The profiles are attached with an invisibly mechanical affirmation to the glass. To intensify the relation with the adjacent garden a big door is created. It is opened with hydraulic cylinders and creates a large porch without disturbing the openness of the facade by opening doors. The large opening part of the facade has a steel Construction of T-profiles that has been made rigid by 40 glued glass plates. Without the seemingly weak looking glass the door would simply collapse. The existing marble of the floor is reused and the same wengé wood of the adjacent auditorium is used to complete the floor finishing to the new outlines of the foyer. The two ceiling levels are materialised in coloured polyester panels and painted rock panel. The polyester panels designed in cooperation with artist Vincent de Rijk hang in a grid that spreads out itself according to the width of the hallway. In this ceiling a line of light is created behind a transparent strip of panels. To reduce costs and keep the façade free from visible installations, the existing heaters were reused and integrated inside a new wall. The wall is made out of long continuous wooden strips through which the hot air of the heaters can flow into the foyer, and glasses and plates can be laid aside. To make sure the climate stays comfortable during hot summer days, the façade is covered with grey solar control glass. For the foyer AAArchitects has designed a big linear bar made out of PU coated steel. The bar which has a sufficient amount of storage space is covered with a wengé wooden top which is movable and covers a sink which can be used when it is pushed open. The doors are designed without handles in black mdf and can be opened electrically all at once by one push on the button. Design team: Amer Alhassan, Wim Smits, Florence Paul, Luigi Depperu, Matteo Frongia.